With sprains or strains of joints or adjacent muscles accounting for half of new workers compensation cases in Australia, The General Mat Company has released a new product addressing the problem. Its new Ortho Stand No 454 is intended particularly to enhance the comfort and health of people who stand at work, featuring a surface of flexible hollow domes to simulate a massaging feeling and encourage frequent changes in posture, promoting improved circulation. Ortho Stand™ No 454 anti-fatigue and safety matting is manufactured by one of the world’s largest specialist producers of safety, anti fatigue and ergonomic matting, The Tennessee Mat Company, maker of the internationally recognised Wearwell range. 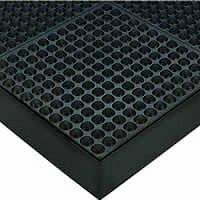 A selection of these top quality mats has been included by the General Mat Company in its PowerBuy range, which includes economically priced mats designed for different industrial and commercial situations. Designed for wet or dry work areas, Ortho Stand provides a safe dry footing, with liquid and debris settling between the domes. Importantly, the heavy duty rubber of the 12.5mm thick mat will not harden over time, ensuring ongoing benefits, says the Managing Director of the General Mat Company, Mr Michael Siegle. "Standing for long periods of time on hard floor surfaces is one of the most common causes of physical fatigue, which occurs when muscles are constricted, causing reduced blood flow. The result is pain and discomfort, especially in the back and legs. The heart is forced to work harder and the body begins to run out of energy, increasing the likelihood of slips, sprains and strains," says Mr Siegle. "National Occupational Health and Safety Commission (NOHSC) figures show that the highest proportion of new workers compensation cases (51 per cent) involve sprains and strains of joints and adjacent muscles. Nearly 25 per cent of all new injury or disease cases affect the lower or upper back," he says.